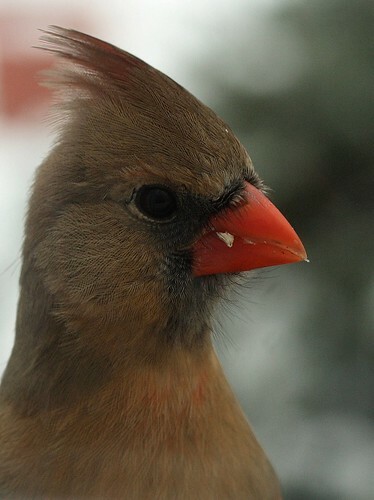 View From my Window- A female Northern Cardinal, originally uploaded by Tom Arbour. I took this shot this morning as a female northern cardinal was eating black oil sunflower seeds placed on our windowsill. Needless to say, they are getting used to the cameras. Wow, such an amazing close shot of the cardinal! BRAVO and glad they are letting you get closer! Great picture, Tom. You're obviously making friends in the avian set. Tom, that is stunning. I find the female cardinal to be as beautiful as the male. I just love this. They are beautiful birds and your photo is very nice. She's soooo cute! I love it! Monarch, thanks a bunch. It is really cool to see the feathers. I'm used to seeing this in your shots of birds in the hand. Thanks wren. Yeah, this girl likes me. I hope Megan doesn't get jealous! Kylee- Thank you. Female cardinals are fantastic. Suniliu- Thank you! It is taken right through my home office window. Tanya- Thank you, your African blog is awesome, everyone here should read it! Abe- Thank you. When I got this shot I was thinking of your images- So many of them provide us with superb details of birds that you can rarely see with binoculars. Mom- Thanks. I can get make you a print if you would like! Thanks everyone. Like I said, this shot took a little luck, a little patience, and some great equipment from Canon! Thank you very much! Thanks everyone for taking the time to comment. I really appreciate it and look forward to reading all of your blogs and seeing what natural happenings are going on in other parts of the state, country, and the world! She looks so serious! :) This is a great close up.